Driving under the influence of alcohol, drugs and other intoxicants is a serious criminal offense in Oklahoma, and a person charged with drunk driving offenses can face severe penalties if convicted. An understanding of Oklahoma laws that can impact your life if you are stopped for drunk driving could prove beneficial, given that charges resulting in conviction could lead to jail time and loss of personal rights and liberties. With the exception of commercial and underage drivers, any person found to have a .08% or greater blood alcohol concentration (BAC) level while driving or attempting to drive a motor vehicle in Oklahoma is breaking the law. Exceptions to the .08% BAC level law is the .04% or greater BAC level for commercial drivers, and .02% for underage drivers (those under the age of 21). Underage drivers face additional restrictions and penalties under Oklahoma’s zero tolerance law. Both the commercial driver and underage zero tolerance laws are discussed below. A charge of driving under the influence often begins to accrue well before contact with a law enforcement officer occurs. Behavior behind the wheel of a car such as swerving outside of lane markings, erratic and sudden lane changes, and the inability to maintain a constant and appropriate speed can be the first signs of possible impairment. Initial suspicions are often increased during a traffic stop by the driver’s personal appearance (for example, watery and red eyes, slurred speech, etc. ), the smell of alcohol on the driver’s breath and coming from inside the vehicle, or the appearance of open containers inside the vehicle. To determine the driver’s level of impairment, the officer will ask a series of questions during the traffic stop, including whether the driver will submit to a field sobriety test. The driver is not required to submit to the field sobriety test. However, they are required to undergo chemical testing for intoxicants under Oklahoma’s implied consent law which every driver agrees to when they accept an Oklahoma driver’s license. If a driver who agrees to a field sobriety test registers a BAC of .08% or more, this result can be used to confirm initial drunk driving suspicions formed by the officer prior to and during the traffic stop. A field sobriety test result of .08% BAC is sufficient under Oklahoma law for drunk driving charges and to cause the driver to be taken into custody. While most drivers know that drunk driving is a crime, they are often less aware that a charge has civil consequences that require immediate attention. When a driver is charged with drunk driving in Oklahoma, their license to drive is also revoked. The driver must then request an administrative hearing, which is a civil proceeding separate and apart from the criminal offense, within 15 days of the charge if they wish to challenge the DUI charge and suspension of their driver’s license. Drivers in the Tulsa area who have recently been charged with drunk driving might benefit from the assistance of an Owasso DUI lawyer who could help them better understand how to initiate a civil administrative challenge to the charges in a timely fashion. Oklahoma has no community service requirement for first and second offense convictions. A hardship license may be available for all offenses to permit driving to and from work and for driving to other locations approved by the court. The BAC limit for commercial drivers in Oklahoma is .04% or more. Commercial drivers who test higher than this limit or who refuse to submit to chemical testing are subject to arrest and drunk driving charges. A first time commercial driver conviction will garner a one-year license revocation, and a second conviction could result in the permanent loss of the driver’s commercial license. If the commercial driver is transporting hazardous material at the time of the charge upon which a conviction is based, the license revocation will be three years on a first offense, and a lifetime revocation for a second conviction. Oklahoma takes a proactive approach towards preventing underage drinking and driving under it’s zero tolerance law. Under this law, it is unlawful for a driver under the age of 21 to have a BAC of .02 or more. The BAC level is set at .02% to allow for traces of alcohol that are contained in commonly used products like mouthwash. Underage drivers accused of drunk driving will also face underage drinking charges since the consumption of alcohol by persons under 21 is illegal in Oklahoma. Criminal penalties for underage DUI conviction can include immediate revocation of driving privileges, fines, community service, and admission to treatment programs. A conviction will likely also have far-reaching social effects on an underage driver’s life as it may serve as a bar to certain future educational and employment opportunities. Once a person is arrested for drunk driving in Oklahoma, their case will proceed through the legal system to resolution. Persons accused of drunk driving offenses will want to take immediate, proactive steps to defend against the charges if they wish to obtain the most favorable outcome under the law. 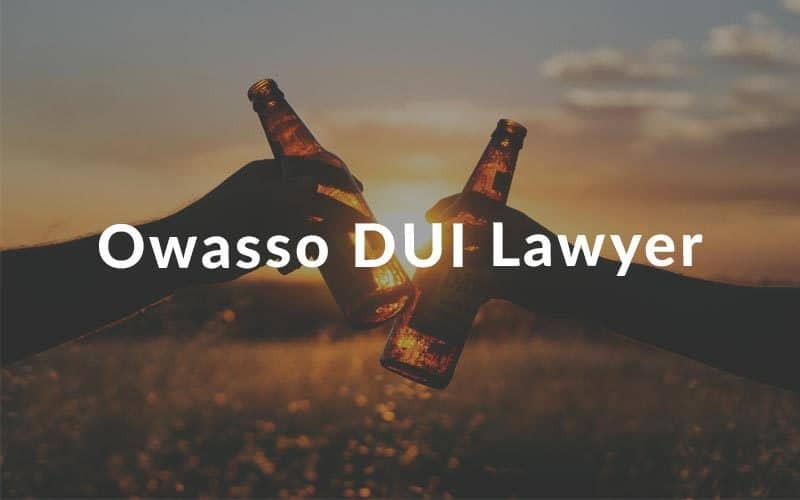 They may benefit from working with an Owasso DUI lawyer to ensure that the charges are based on the true facts of the case, including those that may not be included in the incident report or sobriety testing results. In helping a suspected drunk driver to navigate the various drunk driving laws and possible penalties, an attorney might be able to challenge the veracity of the sobriety testing results upon which the charges are based, as well as get relevant and mitigating information into the court record. They may, at the conclusion of a thorough investigation, be able to get the charges thrown out when deficiencies in sobriety testing procedures are revealed, or where mitigating factors such as medication or medical conditions negate the testing results. An Owasso DUI attorney familiar with Oklahoma law, working with the prosecution, may also be able to negotiate for resolution of the case through a plea bargain without the necessity of going to trial.